Because the interpoint slates offered by the American Printing House for the Blind easily can be mistaken for slates for writing on one side of a page only, the following information is presented to make use of these slates easier. To load paper into either the standard interpoint or interpoint postcard slate, stand the slate on its edge with the hinge pointing left. Open the slate part way so that the hinge is the point of a long narrow letter v.
Stand the paper on its edge between the two plates of the slate. Make sure that the left edge of the paper is backed off a bit from the hinge. When you write on the second side, it will move slightly toward the hinge, and there must be room for it to move without binding at the hinge. Make sure that when you close the slate, all four pins will pierce the paper. If the pins at the ends of line one are in position to pierce the paper when you close the slate, just press against the pins at the ends of line 4 so they do pierce the paper. Then, when you close the slate, the pins at the top will have been lined up to go through as they should. 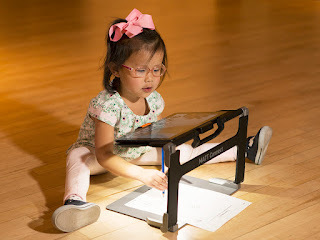 Using the surface of the desk or table to line up the top edge of the paper and the slate makes certain that the slate will be straight all the way down the page. As you write the first side of the page, the hinge will be at the left end of the slate. The pins at the top of the slate are located near the ends of line one, the top line. Just below and to the right of the point where these pins come through the front plate of the slate, there are holes through which you press a stylus. The point of your stylus will make pin marks that face downward toward the top of your table or desk. These pin marks are used to register (line up) the paper for writing on the second side of the sheet of paper. Now, here is the trick to having things work right. When you turn the page over to write on side two, do not turn it over side over side like the page in a book. Instead, turn it over top over bottom. Think of it this way. Suppose you had written the letters a b c d e f g on the first line of page one. As you write, the dots will be facing down toward the table. The letters will be running in a right to left direction. They will be at the far end of the page from you. When you turn the page over top over bottom, the letters will be at the near end of the page but still going in a right to left direction. The dots will be facing upward. Put the paper in the slate at the bottom of the page. A b c d e will be on the line closest to you and running right to left. Now, turn the slate around so the hinge is at the right. Now a b c d e again are at the far end of the page but facing up and in a proper left to right direction. The front or cell portion of your slate will be covering the braille and the dots you write (with the hinge at the right) will not interfere with them. I know I'm about 5 years late, but I still want to say a huge Thank you. I have been so discouraged with my slate because I honestly could not figure out how to get the inter point right to save my life. I even put my slate away and the thought out of my mind for a long time until now. So again, Thank You So very much for this post it has been a tremendous help to me.